The pyramid lit up in rainbow colors. Jan. 23, 2017. Source: Facebook. On January 22, the municipality of Tirana organized an event in the Pyramid of Tirana, the former mausoleum of Enver Hoxha, around the question of its future use. More than a month after an executive order of the Council of Ministers transferred ownership of the building from the state to the municipality, the Pjetër Arbnori International Cultural Center, as it used to be officially called, has become yet another stage for Tirana Mayor Erion Veliaj. 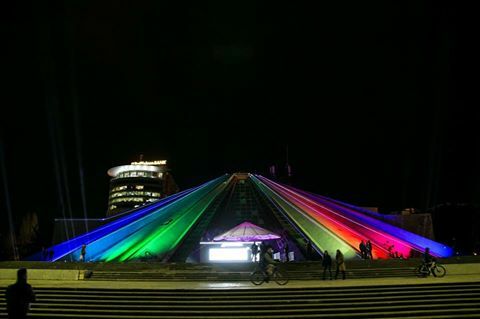 The Pyramid was lit up in rainbow colors, copying the decoration from the ecumenical “Prayer for Peace” event which was held there shortly after Veliaj’s election as Mayor of Tirana in 2015. Closing Ceremony of “Peace Is Always Possible,” the 2015 ecumenic “Prayer of Peace” event. Sept. 8, 2015. Just like many of the other architects in Erion Veliaj’s entourage, Winy Maas’s relation with Tirana dates back to the period in which Edi Rama was mayor. MVRDV, Winy Maas’s architecture firm, was previously the winner of the Unaza Urban Complex Competition in 2005, which is currently being completed as the Toptani Shopping Center near the TID Tower. Back then, the competition jury featured Johan Anrys from 51N4E, another architect connected to Rama. MVRDV was also the winner of the Lakeside Masterplan Competition from 2008, which proposed a series of high-rise buildings next to the Artificial Lake in Tirana. MVRDV’s winning Tirana Lakeside proposal. Source: MVRDV. Although in 2016 Mayor Veliaj openly protested in front of the Administrative Appeals Court against the continuation of construction work near the Artificial Lake, he has now invited the architect who first proposed such construction work back to Tirana. This is not surprising. As soon as Edi Rama won the 2013 elections, the Socialist Party organized a large-scale conference “Albania of the Next Generation,” which featured a panel including artist Anri Sala and Winy Maas to discuss the future of the Pyramid. Even though Rama has handed over nominal control over the future of the Pyramid to his close collaborator Veliaj, it is clear that Rama’s preferred architects will continue to have a major role in its future.